Tired of blankets and too frustrated with two socks at once, I decided that I needed some instant gratification (along with a trip to Jo-Ann’s!). An aside: what’s the deal with celebrities hawking yarn? Vanna’s Choice is nice, but Deborah Norville? As if! Anyway, while going through my patterns, I came across this pattern from Knit-Wits. A nice pattern, but the slippers fell off of my feet. A variation of this Mary Jane like slipper was found here at Miss Twiss. 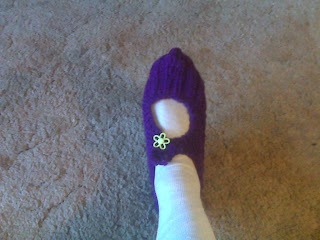 She adds three button holes and a button to keep the slipper on the foot. For a knitter, it’s a soothing pattern that includes increases, decreases, and knit two, purl two ribbing. 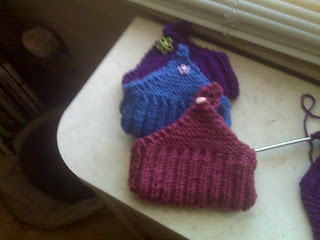 To make for different sizes (I have only made adult sizes) is just a matter of not increasing to 44 stitches, but any stitch in a multiple of 4. 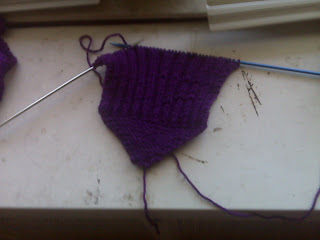 A quick knit, about two hours start to finish. Add an I cord string and this could be a little bag for someone…hmmm. I found some cute buttons to add to the side for embellishment and also for the closer. I now don’t feel as guilty when I watch Judge Judy since I keep my hands busy.